Put "Bossie" to work keeping all your houseplants fresh and well-watered. 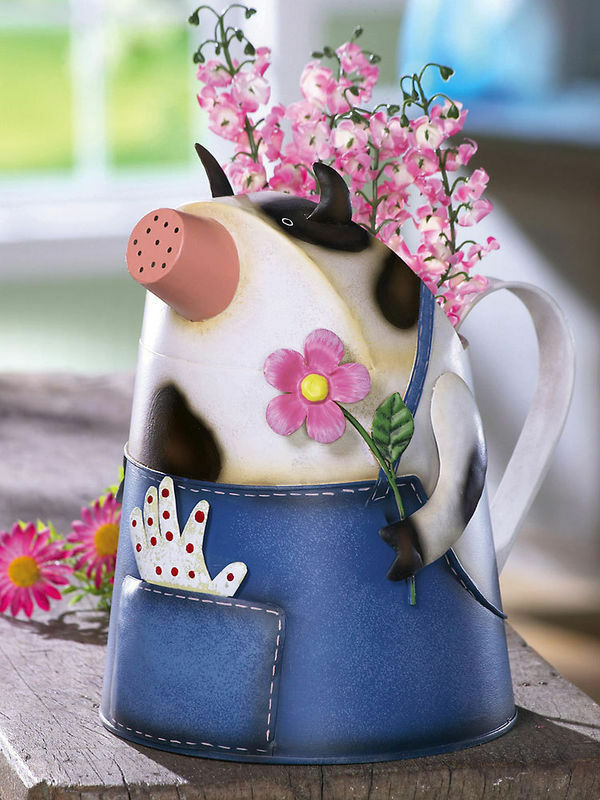 Hand-painted metal watering can is so charming you can display it anywhere to give a delightful bit of farmyard fun to any room. Water flows from the spout in the cow's snout. 9" x 7" x 9 1/4". I accept Google,Pay Pal, Money Orders, and SERVE. Cash on your own. If any one thing in my booth is wrong or upsetting to you, please let me know. If necessary I can and will remove the item. If you think I went overboard on pricing, let me know that too. I am able to change any thing and everything. If you don't like me, I can fix that too. So whatever upsets you , I am sure we can fix it. I want every one to be happy with what ever they purchased. If you are not, please contact me. If it is something I can fix I will. Please give me the chance to make it right before you get upset and come looking for me. I want you to be satisfied to the fullest. If the item arrives broke please take pictures of the item and box as well, Send them to me via email. If wanting a full refund send pics and item back. If I have another one of the particular item you then have the option of receiving another one, refund or store credit, which ever you prefer.The items must be returned to me in the same condition it was received. I will return original shipping and cost of item only. Buyer must pay for return shipping. Please contact me before returning your items.